Maiolica is an Italian term used to describe a tin-glazed ceramic that reached the height of its popularity during the fifteenth and sixteenth centuries. 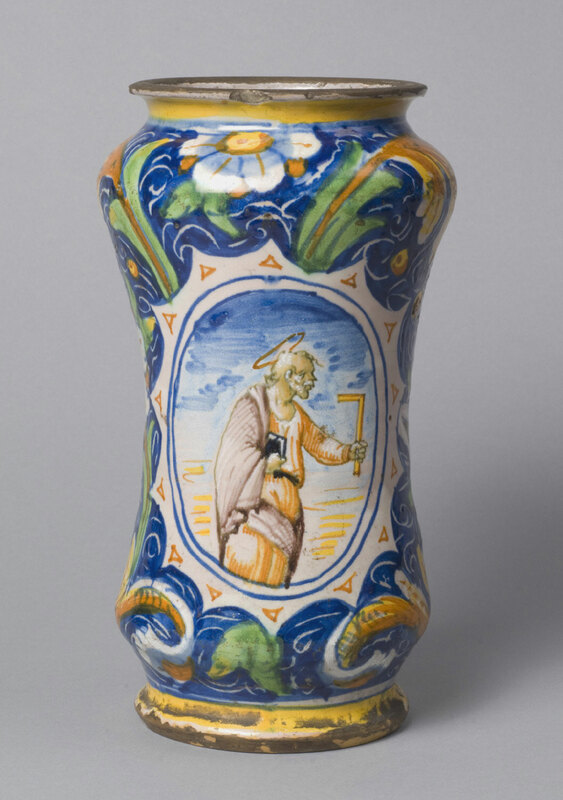 Fairly inexpensive, maiolica wares were suitable for everyday use, frequently taking the form of pharmacy jars, vases, and dishes. Maiolica was born of a desire to emulate porcelain, a delicate and translucent form of pottery that until the eighteenth century only the Chinese knew how to make. The technique was a complicated multi-step process. First, the clay was collected, strained, and dried to a plastic consistency. Then it was shaped into the desired wares, by wheel, mold, or hand and fired in a kiln. Once fired, the ceramic was covered with an opaque white glaze containing tin, an expensive metal imported into Italy from England or the Low Countries (present-day Netherlands, Belgium and Luxembourg). The porous ceramic absorbed this glaze immediately, leaving a powdery white coating on the surface. It was then painted using pigments made from ground metals suspended in water. The most common pigments were made from metallic oxides: copper made green, iron made orange, manganese made purple, cobalt made blue, antimony made yellow, and tin made white. Again the ceramic absorbed the water in the paint, leaving the pigments on the surface and making it nearly impossible to correct any errors or change the composition. When the painting was completed, some vessels were coated with a shiny lead glaze, and then all were fired again at a slightly lower temperature.